"It is unique, it is gigantic and it is beyond the means and purview of the (Orissa Pollution Control) board to solve the problem"
Even as the authorities duck under the too-hot-to-handle alibi to wash their hands of the crisis, a death warrant seems to have been signed for about half-a-million people residing in the vicinity of Sukinda valley's chromite mines. Spread over Orissa's Dhenkanal and Jajpur districts, the valley was singled out in a recent report of the Comptroller and Auditor General (cag) as a highly polluted area. It is the profit-driven mining companies that are destroying the ecology of the region. And this has started taking its toll on the local people. Hexavalent chromium -- declared a carcinogen by the World Health Organisation (who) -- has been found to be posing a major health risk due to unscientific mining in the area. A public interest litigation suit has been filed in the Orissa High Court to direct the state government to take 'appropriate action' and bring out a health status of the valley. Ironically, though local mining activity can be traced back to the independence period, officially no comprehensive health study has been carried out as yet. But the results of sporadic surveys conducted by non-governmental organisations (ngos) are grim enough to set the alarm bells ringing. While these studies have reported acute health problems due to chromium contamination of the whole ecosystem, the cag report is more categorical: "The valley has been witnessing hexavalent chromium pollution in its air, land and water due to 12 operating mines." Significantly, around 13 mines in the area have no 'environment management plan' to operate further. On its part, the Orissa government has so far played the role of a silent spectator, contending that it is hamstrung by the absence of pollution control norms for hexavalent chromium. Highly hazardous Orissa holds nearly 95 per cent of the country's total chrome deposits. The heavy metal, chromium, generally exists in a trivalent form in nature. Certain proportions are, however, also found in the hexavalent form (Cr-vi). This composition is highly unstable and is thus a powerful oxidising agent that can cause serious damage to health. The metal does not contribute directly to air pollution but it can send suspended particulate matter (spm) levels spiralling upwards. As per Central Pollution Control Board (cpcb) and who stipulations, the level of hexavalent chromium in potable water should not be higher than 0.05 milligrammes per litre (mg/l). That a study has found the level of the ion to be as high as 2.5 mg/l in the water sources of the valley shows to what extent the permissible limit has been exceeded. In fact, Damsala river -- the region's lone perennial water source -- has virtually turned into an effluent discharge canal for the mines. Different research groups have arrived at the same conclusion: a high concentration of hexavalent chromium in the water body. Not only is the 20-kilometre stretch of the river used for irrigation, it is the only source of water for the tribal people of the area. R B Panda, general secretary of Centre of Environment Care, alleges that about 1000-1500 litres per second of untreated water (see box: Water treatment techniques) is discharged by the mines into the river. When queried on this, mining companies had no comments to offer. The Regional Research Laboratory (rrl), Bhubaneswar, has significantly found no hexavalent chromium at the point of origin of the river. This finding runs contrary to the theory presented by the Orissa Pollution Control Board (opcb) and mine owners, who contend that hexavalent chromium was present in the water body even before mining operations commenced. Chromite mining has harmed Sukinda valley in more ways than one (see map: Wreaking havoc ). In a span of two decades its degraded forestland rose from 731.88 hectares (ha) to 1,828.98 ha in 1994. Of late, Cr-vi is said to have entered the food chain of Sukinda valley. Its presence beyond permissible limits has been found in paddy, fish, milk, fruits and aquatic grass. Highlighting another problem area, cpcb scientist A Manoharan says that up to 50 mg of Cr-vi per kilogramme (kg) of solid waste is allowed in chromite mines. 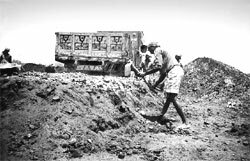 About 7.6 million tonnes of exhausted and rejected minerals had been dumped in the region's abandoned quarries till March 1999. This led to the release of 11.73 tonnes of Cr-vi into the surroundings. "There is no doubt that hexavalent chromium is being released into the atmosphere. But in what proportion it will be detrimental to health needs to be assessed," says opcb chairperson S K Ghosal. "The board is handicapped due to a paucity of funds," he adds, explaining away the inaction of the authorities. The Orissa Voluntary Health Association (ovha), an ngo which conducted a survey in the region in 1995 under the Orissa Environment Programme funded by the Norwegian government, reported acute health problems. The findings of ovha were a startling pointer to the health hazards of mining: among the total cases of mortality, 84.75 per cent deaths in the mining areas and 86.42 per cent deaths in industrial villages occurred due to diseases. The survey report maintained that villages at a distance of less than one km from the sites were the worst affected, with 24.47 per cent of the inhabitants found suffering from pollution-induced diseases. The survey concluded: "The pollution and health hazards related to hexavalent chromium are acute, causing irreparable loss to human health." "It has the potential to cause ulcers in the pulmonary system and gastrointestinal tract, and may also lead to cancer," warns Manoharan. who confirms that Cr-vi may cause skin cancer. A senior physician, who has worked for around 12 years in Sukinda valley, says the chances of getting affected by these incurable diseases are high as workers and residents come in direct contact with hexavalent chromium every day. The future doesn't hold much hope for the residents of Sukinda Valley. With countries like South Africa and Australia giving India a run for its money in the international chromium market, mining establishments in Sukinda valley are likely to put environmental concerns on the backburner. Mohit Das, general manager, Tata Iron and Steel Company (Tisco), says: "The government should allow mining to grow as an industry. At the same time, it should enact stringent laws and leave no escape route for polluters." Smaller players are now being allowed to operate in the valley. Experts opine that the move is affecting the environment adversely as these companies do not spend on environment protection activities. The end result: a verdant valley has gone to seed.